Hello! 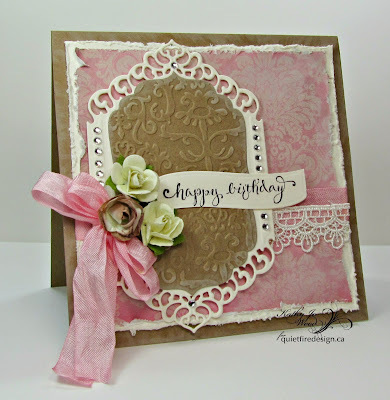 Jutta here today with a fun and whimsical Word Art Birthday Card project. 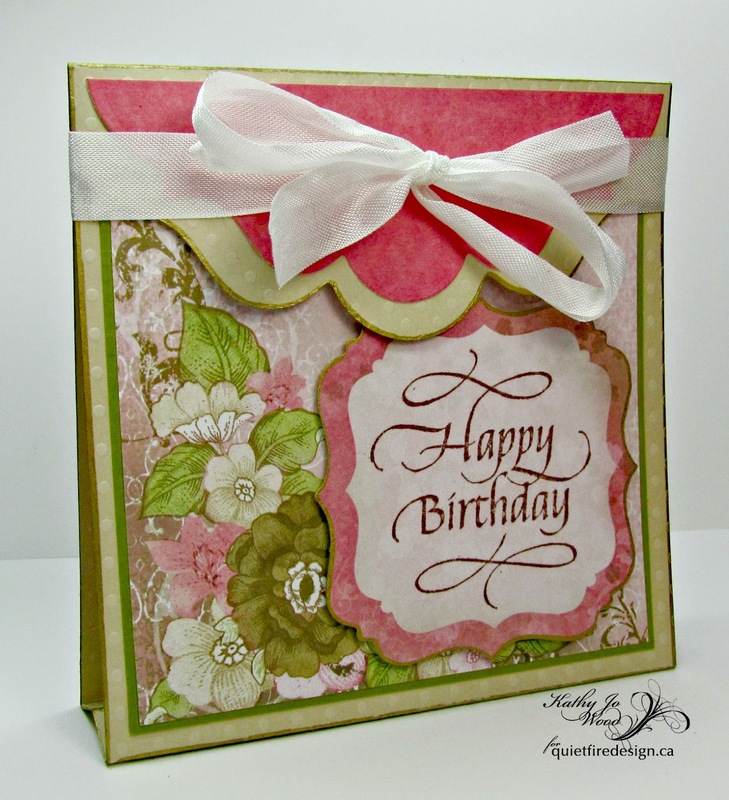 On this card I used several stamps from the Quietfire Design -Happy Birthday Plain & Simple Stamp Set. The latest greatest stamps came mounted so it was super easy to use them with the fun Stamping Gear - Circle Wheel. To make this large card, fold a pc of 8-1/2" x 11" white cardstock in half. (see stamp placement in photo below) stamp the center flower first with Ripe Persimmons Distress Ink using every 2nd slot as indicated by a small arrow on the gear. I coloured mine for quicker reference. 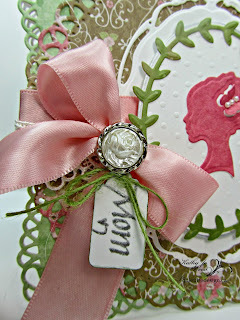 Before stamping the other two flowers mask the edges of your card by about 1/4". I stamped the upper flower (Sun) with Squeezed Lemonade Distress Ink and the lower flower with Spiced Marmalade Distress Ink. When finished stamping the flowers, add stems in Mowed Lawn Distress Ink and several Happy Birthdays across the bottom. 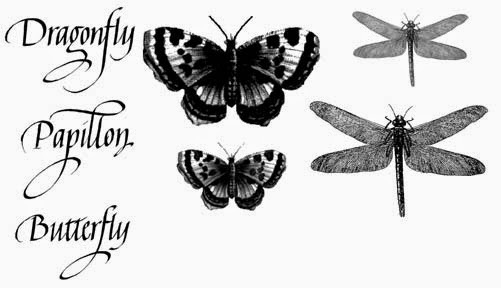 Then add the Dragonfly from the Butterflies and Dragonflies Stamp Set. Complete by with some Wink of Stella Glitter Pen on the wings, also add some dabs of sparkle to the flower centers. Last I used a .01 Micron Pen to draw my frame. Thanks for stopping by and sharing a part of your weekend with us! Happy Canada Day tomorrow and Happy July 4th too! Hello All! 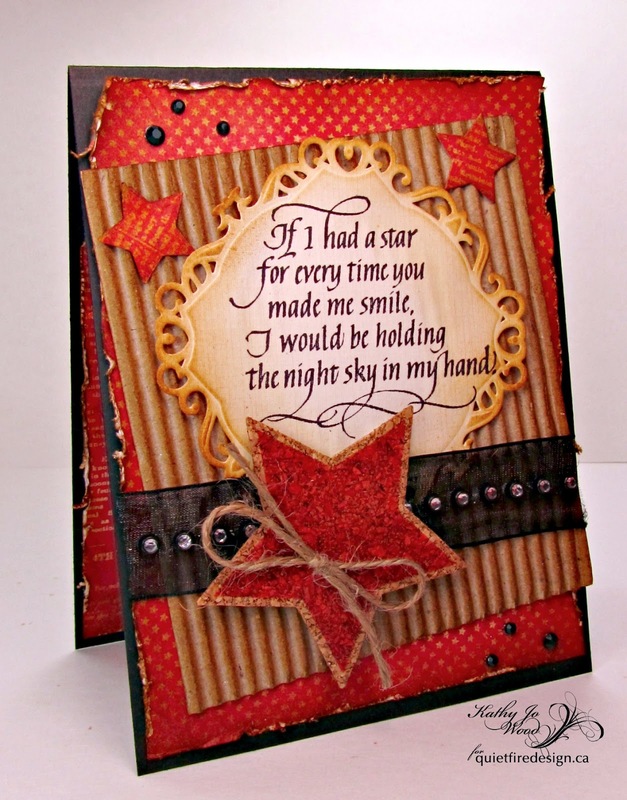 Kathy Jo here to share a grunge card I made using Quietfire's If I Had A Star stamp. Isn't it a heart warming sentiment? The base was made from black card stock, Authentique's Pride paper was distressed and adhered as shown. A piece of corrugated board was cut to size and distressed. 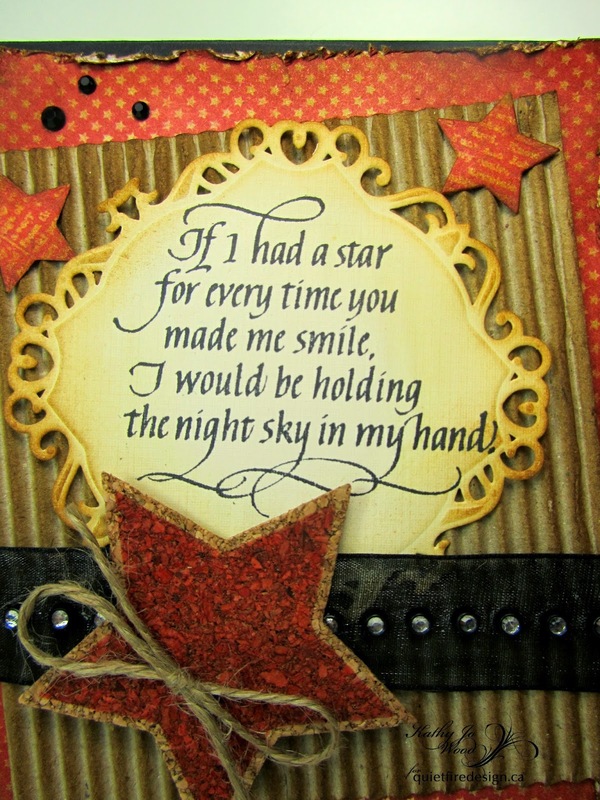 If I Had A Star was stamped on ivory card stock die cut (Spellbinders' Decorative Labels Thirty Four and Spellbinders Tool n' One) and distressed. 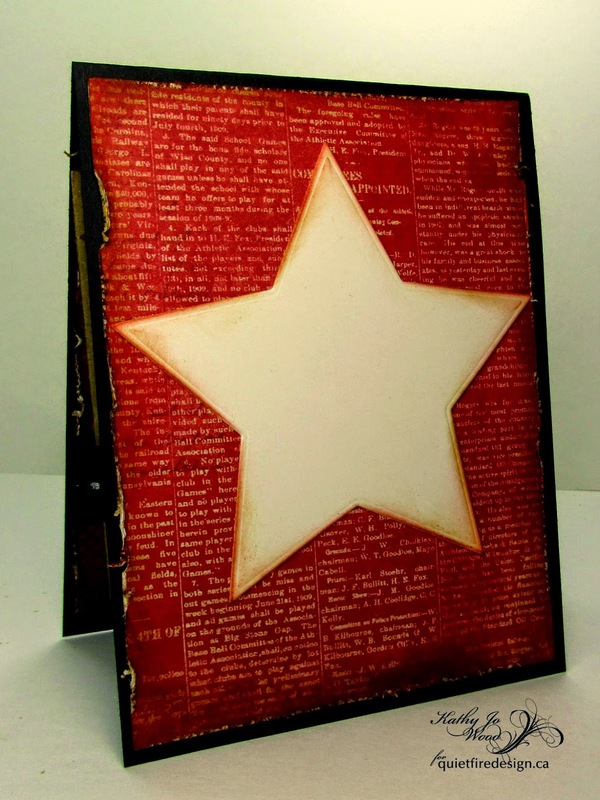 A scrap piece of cork was die cut using Spellbinders' Stars die and while the cork was still in the die, Distress Ink in Fired Brick was applied. The inside is another ivory star die cut distressed and applied on another sheet of the Pride paper. Thanks so much for stopping by! Have a great Thursday! Getting ready for the 4th..
be fun to create a simple card to send out with that theme. rubber stamp with in Cobalt Archival ink and clear embossing powder. between all of the pieces that i cut. adhesive glittery stars that really matched well too to put on it. I just love the card Yogi made for yesterday's post! 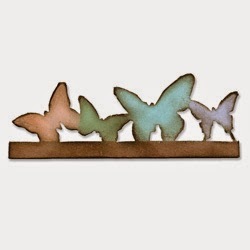 So today, we're giving away Tim Holtz Butterflight Sizzix die and one of our stamp sets Butterflies/Dragonflies. This is a bigger prize than usual because we won't have a Tuesday Winsday next week as I will be a butterfly flitting in the Rocky Mountains. Yogi here today with another CAS card. I die cut the butterflies (Sizzix Tim's On The Edge die "Butterflight") from Tim's adhesive backed Masking material. Used the negative of the mask and then inserted the cut apart butterflies and sponged one butterfly at a time with Distress Festive Berry, Mustard Seed, Broken China. 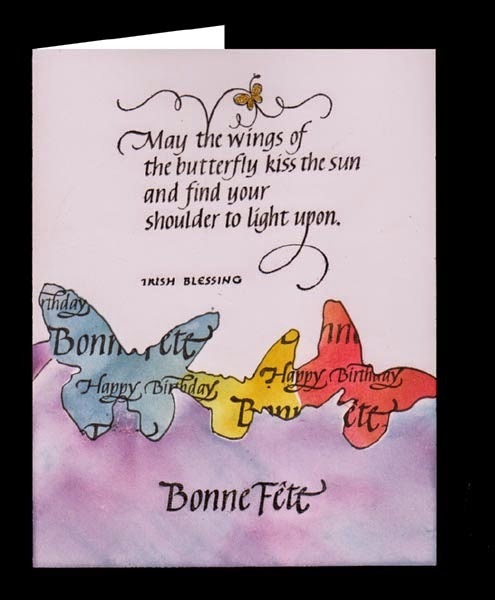 Removed the positive butterflies and stamped the "Bonne Fete" and "Happy Birthday" through the mask, using Versafine Black Onyx. While the mask was in place, used a black Micron pen to outline the butterflies. Removed the negative mask. Stamped the "Bonne Fête" in the bottom section and clear embossed it. Put the positive butterflies down, putting a small piece of tape where I had cut them apart. Sponged with a dirty purple sponge that had the Picked Raspberry on it, then added Shaded Lilac and Broken China. Stamped the quote "May the Wings" with the black and clear embossed. As a final touch, put a bit of Quickie Glue in the small butterfly and sprinkled with Glitter Ritz micro fine glitter in gold. Happy Birthday Plain & Simple! Good morning! Sherry here today with an A2 sized card to share using Quietfire Design Happy Birthday Plain & Simple and Prima Stationer’s Desk. A cream card base was die cut with Spellbinders A2 Matting Basics A and then a background layer was die cut from the Stationer’s Desk collection with Spellbinders A2 Matting Basics B. The background layer was distressed and sponged with Antique Linen Distress Ink. 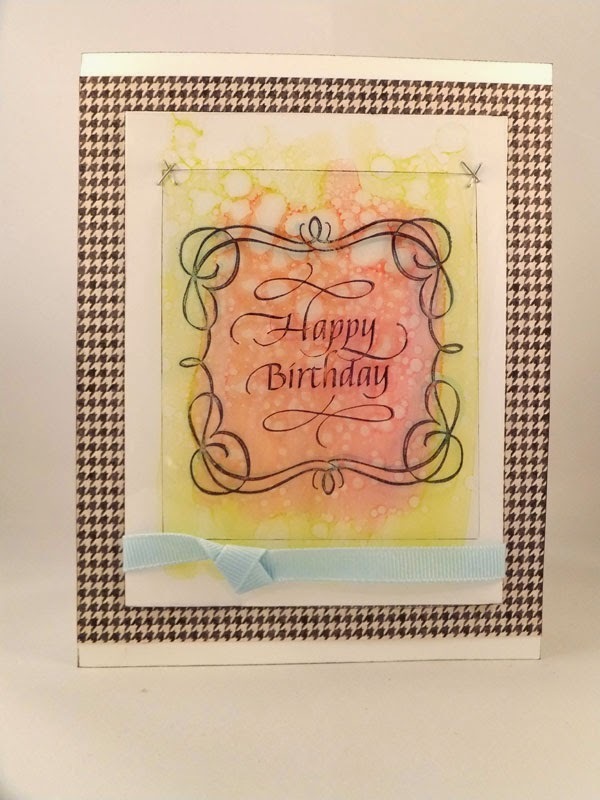 A frame was die cut from coordinating paper with Spellbinders Labels 38 and the sentiment was stamped on another piece of coordinating paper in black ink. The flower was made using Spellbinders Bitty Blossoms from more coordinating paper from the Stationer’s Desk collection. The leaves were cut from another sheet of coordinating paper with Spellbinders Foliage, and then inked with Forest Moss Distress Ink. I found the ribbon in my stash jar and can only guess it was either dyed with Peeled Paint or Forest Moss Distress Ink. That’s it for me today; thanks for stopping by and joining me! Happy Thursday, All! 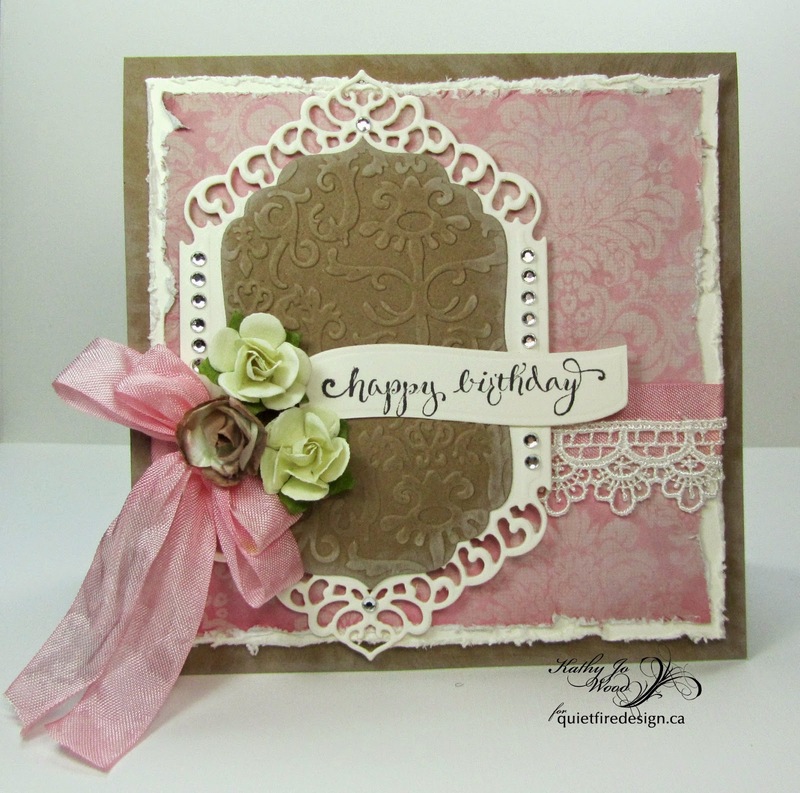 Kathy Jo here to share some cards using beautiful Quietfire stamps and the lovely Kaisercraft paper collection, Chanteuse. The first card is a shaped cameo mom card. Several dies were used on this card (starting from the base up and all are Spellbinders): Grand Decorative Labels One, Grand Stately Circles, Opulent Ovals, Ovals, and Silhouette. On the bow I added a pearl button and "Mom" from Quietfire's Home Is Where Your Mom Is stamp. 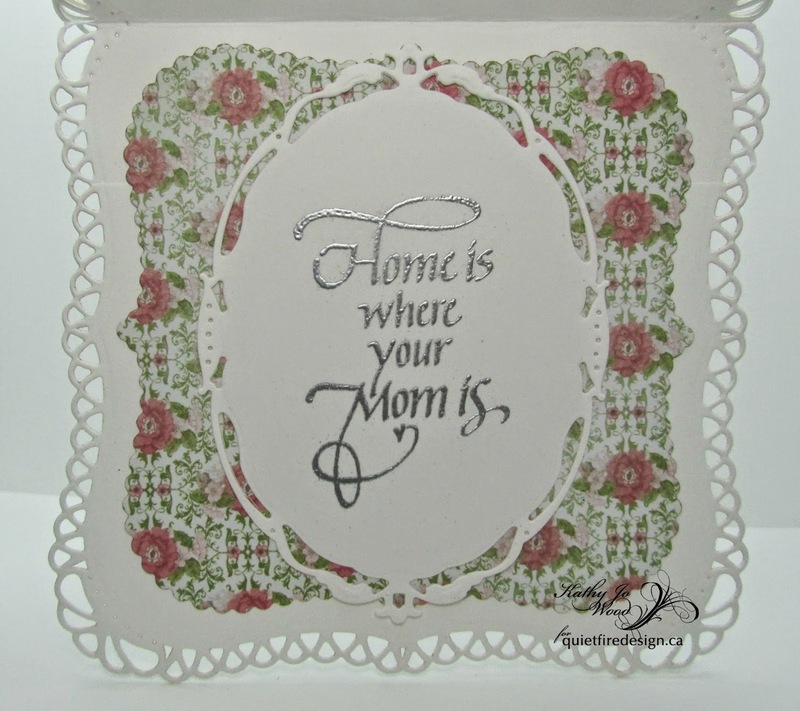 The inside is a die cut (Scalloped Labels One) from Chanteuse and Opulent Ovals die cut of "Home Is Where Your Mom Is". 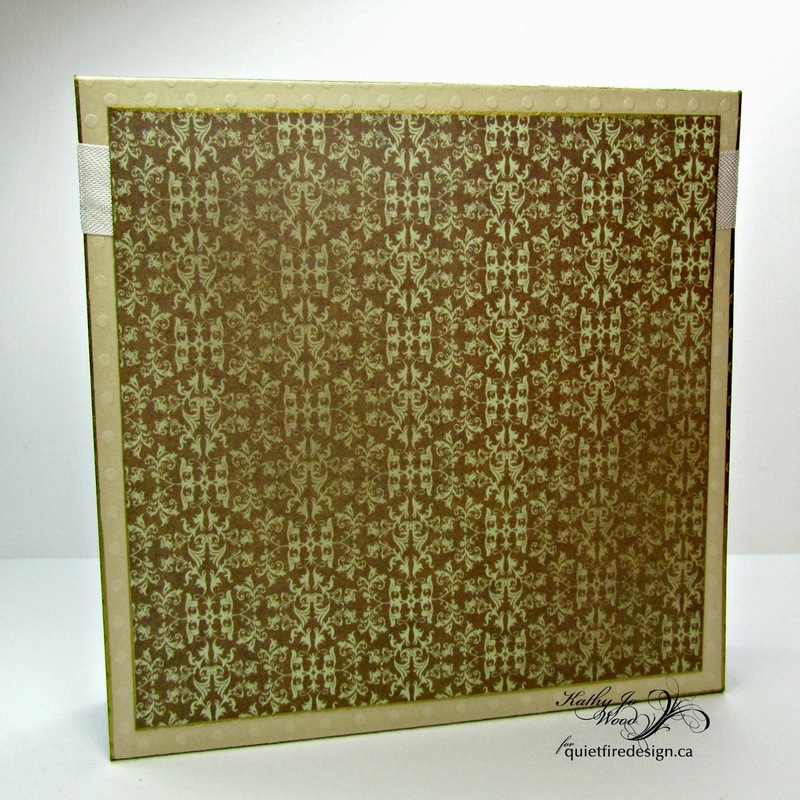 The card is easy to make: cut 12" x 12" ivory card stock to 4" wide. Score "down" at 4.5", 5.5" and 10". Flip the paper over and score at 5". That is the basic shape of the card...told you it was easy! I wanted to add some shape to the flap so I die cut the flap using Spellbinders' Labels Twenty. Here is a shocker to you all so I hope you are sitting down while you read this next statement- I did not use any other die sets on this card. I did not need to because Kaisercraft's Chanteuse Collection already has die cuts in the paper pad! 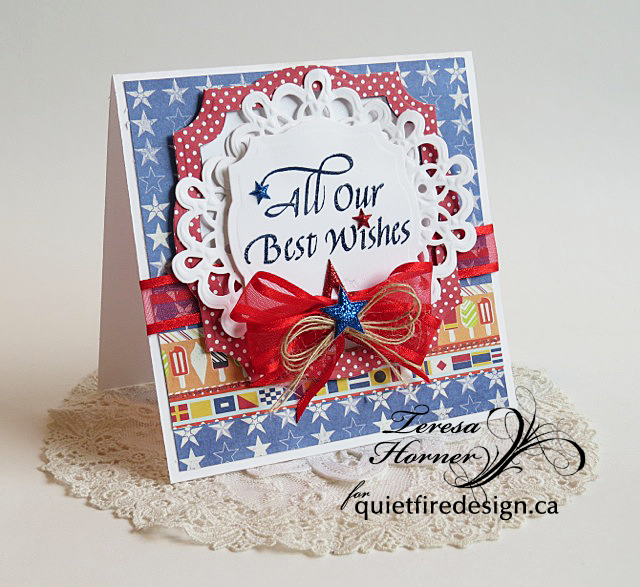 On one of the die cuts I stamped Quietfire's Happy Birthday and used a gold leafing pen along the edge. A sheet of the corner flowers paper was cut to 4" square and mounted on green card stock. This stack was mounted to the front. A piece of the pink paper was die cut and applied to the flap. A piece of seam binding was cut and assembled onto the card back. Brown patterned paper from the same pad was cut to size and assembled over the seam binding. The inside is more of this pretty paper- one was adhered to a green base and another was cut smaller and applied to a pink base. The smaller cut paper had tape only applied to three sides so that a gift card could be inserted. The tent fold base was made from kraft card stock and Tim Holtz' Distress Stain in Picket Fence was applied along the edges. Ivory card stock was cut to size and distressed along the edges. 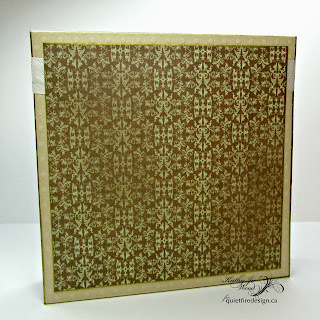 Kaisercrafts Chantuese Collection paper was also cut to size and distressed. 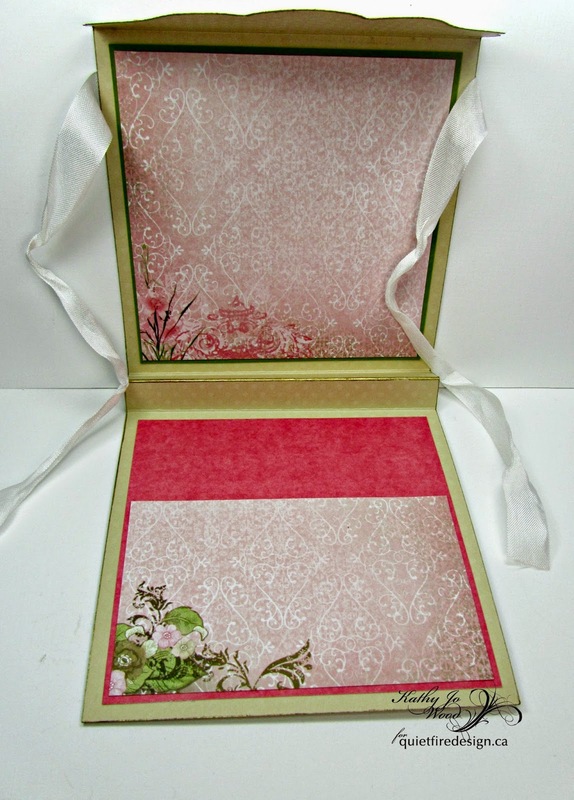 Ivory card stock was die cut using Spellbinders' Devine Eleoquence. Kraft card stock was embossed using a Cuttlebug embossing folder, die cut using Spellbinders' Labels Four and Picket Fence applied along the edges. 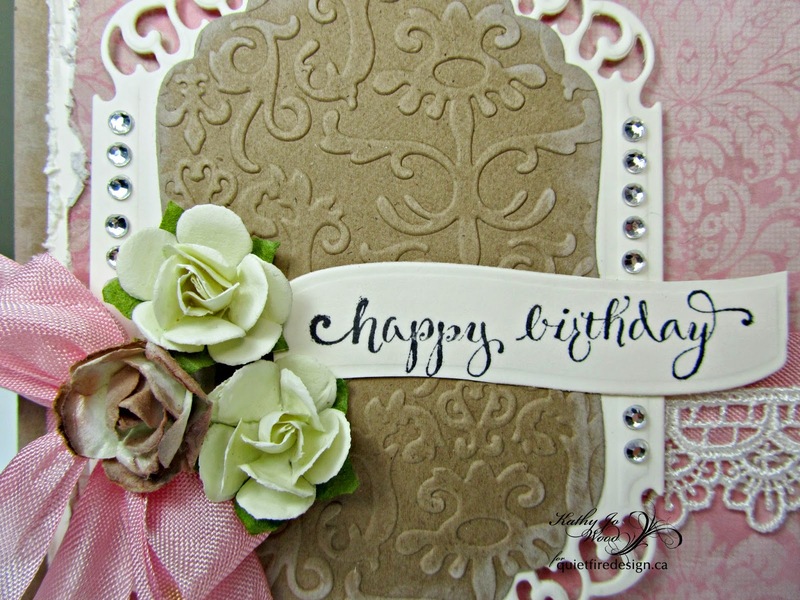 Next, ivory card stock had Quietfire's Happy Birthday stamped in black and then was die cut using Spellbinders's Ribbon Banners. The die was trimmed as shown. Seam binding was dyed using Tim Holtz' Distress Stain in Spun Sugar. A double bow and a wrap were made and applied. A scrap piece of lace ribbon was attached. Bling adhered at will. Thanks for making it to the end of the long post. I hope you enjoyed the above cards...they were so fun to make! I have some great news: all of the Kaisercraft paper is on sale now for 20% off! Yay! Even more good news: the Mom stamp used in the first card and the Happy Birthday set used on the shabby card are also 20% off! Woo-who! Today we have a special guest, Sara Naumann, sharing a Spectrum Noir colouring technique and video tutorial. Thank you Sara! 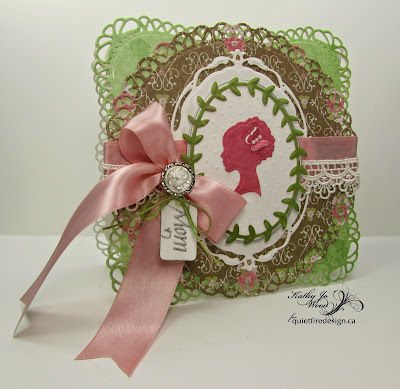 Here’s a fun way to get instant color to show off a beautifully stamped card sentiment! Spectrum Noir alcohol pens are ideal for coloring non-porous surfaces like acetate. Even better, they can be used to highlight stamped images as well, creating layers of depth and dimension. I’m using the Gentle Thoughts Happy Family Days stamp set—I love its elegant scallops and lettering, so I wanted the colored background to accentuate it without compromising the beauty and sentiment of the stamps. I think the alcohol pens give just the right amount of color, and tracing the scallop edges of the frame stamp give it a pretty shadow effect. 1. Cut a 5”x4” piece of acetate. Use the chisel tip of the CG2 (lemon lime) Spectrum Noir pen to scribble across the center, leaving the edges uncolored. Let dry—this will only take a second. 2. Repeat to scribble with the chisel tip of PP5 (pink) pen in just the center of the lemon lime. 3. Spritz lightly once with spray rubbing alcohol. Repeat to create more of a spatter effect. 4. Use black Surfacez ink to stamp the frame and Happy Birthday in the center of a 3 3/4” x 3 1/4” piece of acetate. Flip the piece over and use the fine tip of the BT5 (blue) pen to trace alongside the stamped frame. Flip over and ink the edges with black. 5. Use a touch of stick glue in the center to secure the stamped piece on top of the inked piece, then add mini staples at the top corners. 6. Mat on a 5” x 4” piece of white cardstock, then wrap with blue ribbon. Glue a 6”-tall piece of houndstooth paper to the front of a 6 1/2” x 5” blank white card, leaving the top and bottom edges showing. Ink the edges black. 7. Glue the stamped piece in the center. Want to see a step-by-step video tutorial for this technique? Just click the link below! Thanks to Suzanne for inviting me to be a part of the Quietfire blog! To celebrate Sara's guest post, we're offering 20% off Happy Family Days until June 30, 2014. At checkout use coupon code: SARA You must be signed in for the code to apply. Tuesday Winsday - Win our Gingko set! 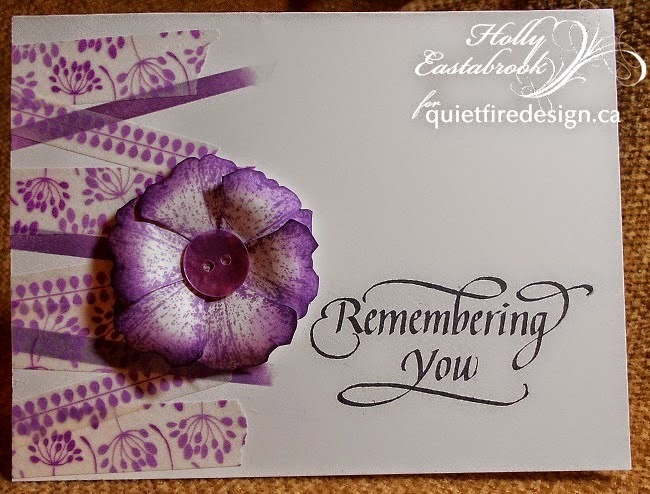 Did you see the very cool flower that Holly created with the Quietfire Gingko set yesterday? I don't think I would have thought of that in a million years! For full instructions for making this card, click here. Those gingko leaves were from a tree that I loved. I bought it in Burnaby and moved it to Port Alberni in a pot where it stayed for years. Once it was planted in the ground, it grew like crazy! Of course planting it should have foreshadowed a move..... and it did. So these stamps remind me of that valiant little tree. I hope it's still doing well. I miss my gingko! Good Luck and thanks for playing!! Hi Everyone! Holly here, and I have a card using a new stamp, and washi tape. A little ink, and a little cutting, and a stamp to top it off. 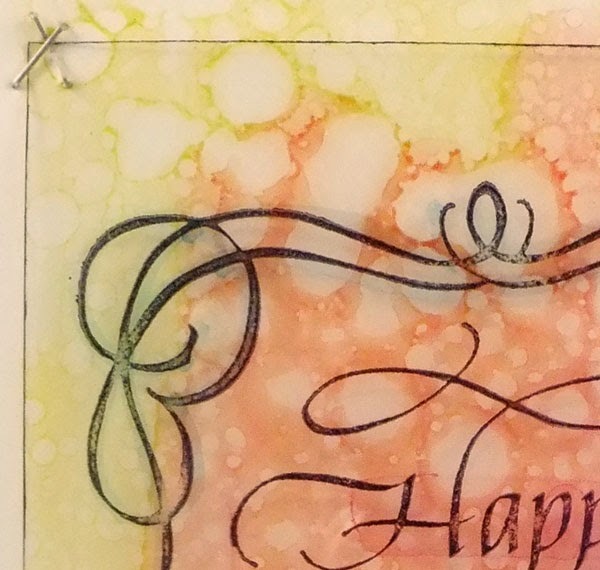 Along the left edge of my white card base, I masked narrow strips and sponged DISTRESS INK. I tore strips of WASHI TAPE and angled and overlapped them, leaving ends hanging off the edge of the card. Once I was sure of the positioning of the washi tape strips, I trimmed the ends even with the card edge. I stamped REMEMBERING YOU from the GARDEN BENCH STAMP SET, with Jet Black ARCHIVAL INK to the lower right side of the card. Using the same DISTRESS INK as for the masked stripes, I stamped GINGKO LEAVES onto white card stock. I cut the leaves out, gave them a slight curl by pulling them along my pinched finger and thumb, brushed them with water to blur the ink a little, and soften the look. Then, I attached these leaves to an adhesive circle. More DISTRESS INK was sponged on the outer edges, and a button was adhered to the center. 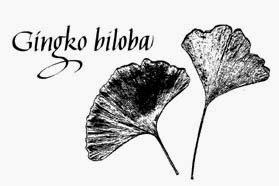 The gingko 'flower' was then attached to complete the card. I hope you enjoyed the making of this card, and decide to try it too. Thank you for looking, and have a creative day!